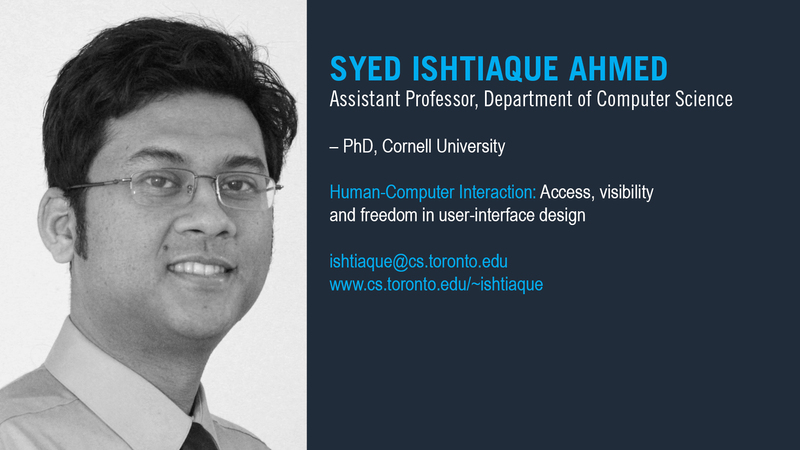 Assistant Professor, Department of Computer Science, Syed Ishtiaque Ahmed, joins the department after completing his PhD studies at Cornell University. Dr. Ahmed’s research in Human-Computer Interaction (HCI) focusses on the design of technology to give voice to marginalized people, especially in developing countries, and his work offers a new perspective in visibility and freedom to complement computer science’s existing strengths in user interface design. Dr. Ahmed appointment began July 2017. 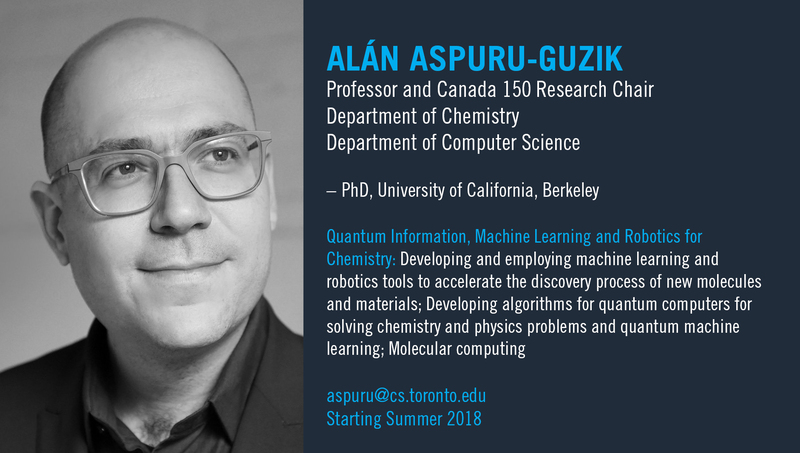 Professor Aspuru-Guzik will join the University of Toronto as a full tenured Professor and Canada 150 Chair in Theoretical and Quantum Chemistry with the Department of Chemistry and Department of Computer Science. He is currently Professor of Chemistry at Harvard University, where he started his independent career in 2006 and was promoted to full Professor in 2013. He obtained a PhD from the University of California, Berkeley in 2004, where he also was a postdoctoral scholar from 2005-2006. Aspuru-Guzik carries out research at the interface of quantum information. machine learning, robotics, and chemistry. In particular, he pioneered the development of algorithms and experimental implementations of quantum computers and dedicated quantum simulators for chemical systems. He has studied the role of quantum coherence in excitonic energy transfer in photosynthetic complexes. He has accelerated discovery by means of computation for organic semiconductors, organic photovoltaics, organic batteries and organic light-emitting diodes. He is currently very active in the development of generative machine learning models for molecular design and platform approaches for robotic chemical synthesis. He developed the online MOOC "The Quantum World" and is interested in furthering online education. Aspuru-Guzik has recently begun research in molecular computing platforms. Amongst other recognitions, Aspuru-Guzik has been the recipient of the DARPA Young Faculty Award, the Sloan Research Fellowship, and was selected as a Top Innovator under 35 by the MIT Technology Review. He is a fellow of the American Physical Society and in 2013 he received the Early Career Award in Theoretical Chemistry from the American Chemical Society. In 2017, he became a fellow of the American Association for the Advancement of Science (AAAS). Dr. Aspuru-Guzik's appointment begins summer 2018. 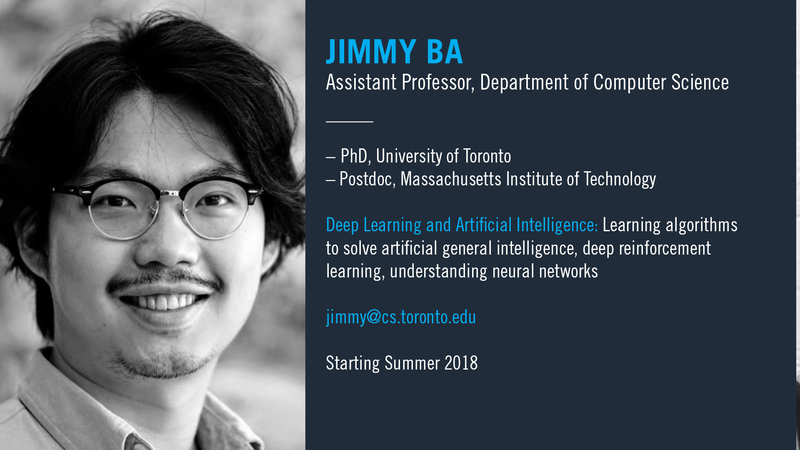 Assistant Professor, Department of Computer Science, Jimmy Ba, is already well known to the department as a graduate of the University of Toronto's Edward S. Rogers Sr. Department of Electrical & Computer Engineering (ECE), working under the supervision of University Professor Emeritus of the Department of Computer Science, Geoffrey Hinton. Ba is a rising star in deep neural networks research and will be joining our word-leading Machine Learning research group. Ba's appointment begins summer 2018. Assistant Professor, Department of Computer Science and the Department of Statistical Sciences, Fanny Chevalier, was formerly a postdoctoral fellow in the Dynamic Graphic Project (DGP) lab and OCAD U a few years ago, and has since served as a sessional lecturer in the department a number of times over the past few years while conducting her research at Inria, the French Institute for Research in Computer Science and Automation. She is a PhD graduate of the Université de Bordeaux, France. 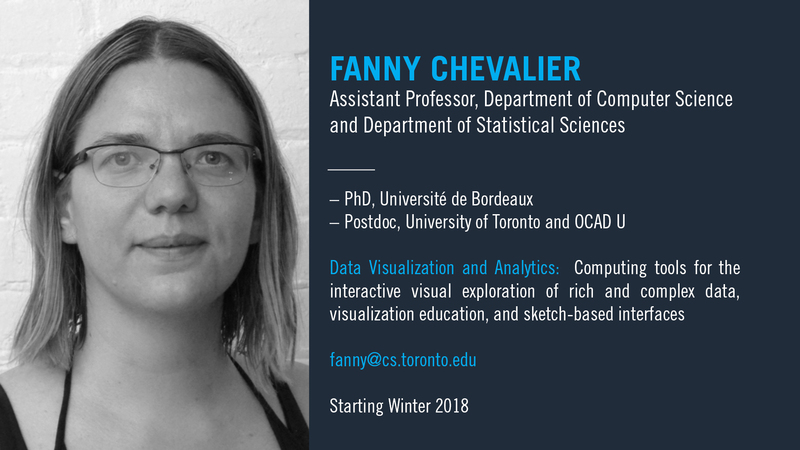 Dr. Chevalier brings a wealth of experience in data visualization analytics, including methods and computing tools for the interactive visual exploration of rich and complex data, visualization education, and sketch-based interfaces, and will contribute to U of T’s growing strength in data science. Dr. Chevalier’s appointment began January 2018. Assistant Professor, Department of Computer Science and the Department of Statistical Sciences, Murat A. Erdogdu, is a PhD graduate of Stanford University and is currently undertaking his postdoctoral studies at the Microsoft Research, New England. 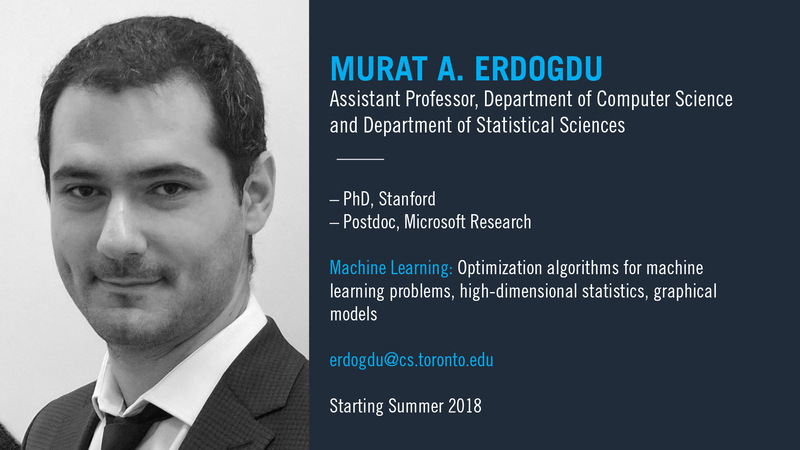 Dr. Erdogdu’s research in machine learning includes, optimization of algorithms for machine learning problems, high-dimensional statistics and graphical models. His appointment expands on the partnership between computer science and statistical sciences, and adds another exciting strand to the University’s growing Machine Learning group. Dr. Erdogdu’s appointment begins summer 2018. 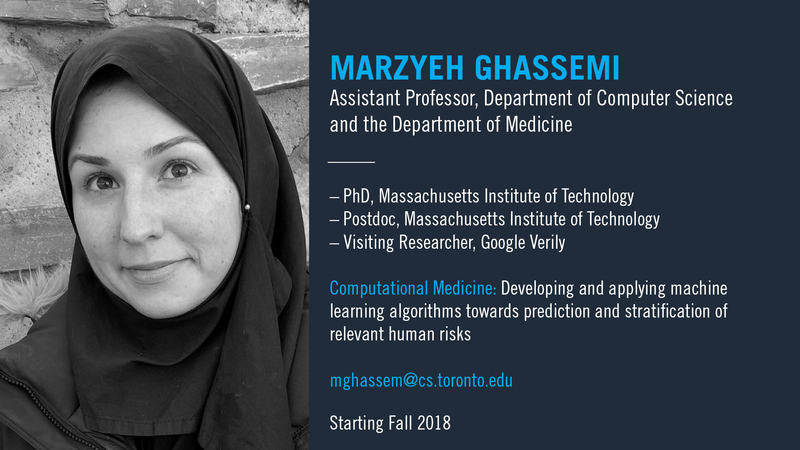 Assistant Professor, Department of Computer Science and the Department of Medicine, Marzyeh Ghassemi, is a PhD graduate of the Massachusetts Institute of Technology (MIT). She is currently a Visiting Researcher at Google Verily, and is completing part-time postdoctoral studies at MIT. Dr. Ghassemi’s research in computational medicine looks at developing and applying machine learning algorithms towards prediction and stratification of relevant human risks. Her appointment will strengthen computer science’s collaboration with medicine. Dr. Ghassemi’s appointment begins summer 2018. 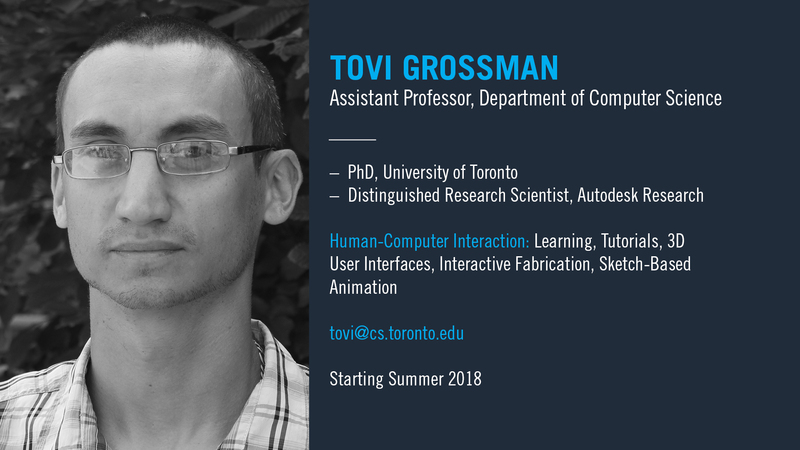 Assistant Professor, Department of Computer Science, Tovi Grossman, is already well known to many in the department, as a University of Toronto PhD graduate and through his long-standing relationship with computer science as a mentor to students in his role as research scientist at Autodesk. Dr. Grossman’s research in Human-Computer Interaction (HCI) includes learning, tutorials, 3D user interfaces, interactive fabrication and sketch-based animation. He has an impressive record of best paper awards at the Association for Computing Machinery (ACM) conference on Human Factors in Computing (CHI). Dr. Grossman's appointment begins summer 2018. Professor Arvind Gupta is returning to his alma mater from the University of British Columbia (UBC) where he has held significant leadership roles, most notably as CEO and Scientific Director of Mitacs Inc., and as President and Vice Chancellor of UBC. At Mitacs, Dr. Gupta achieved international success for bringing together 60 universities with more than 1,000 industrial partners to create novel research and training programs. Within his role as President and Vice Chancellor, Dr. Gupta developed UBC’s long term strategic framework designed to further boost the global recognition of the University. 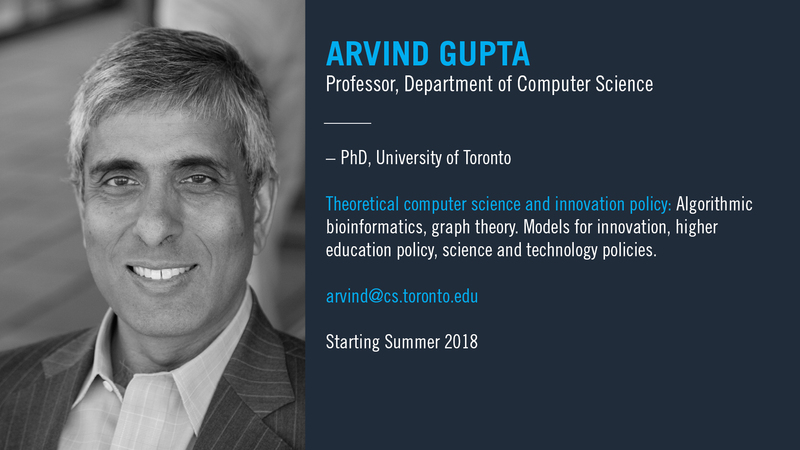 Dr. Gupta is a Senior Fellow of the Asia-Pacific Institute, a Member of the Government of Canada’s Science, Technology and Innovation Council (STIC), and serves on the Boards of the IC-IMPACTS NCE, BIRS, Fields Institute, the Canadian Statistical Society Institute, and SIMTREC. Upon joining the Department of Computer Science, Dr. Gupta will take on the administrative role of Academic Director, Professional Programs, where his vast experience will support the department in building the next generation of graduate programs that span the academia-industry spectrum. Dr. Gupta’s appointment begins summer 2018. 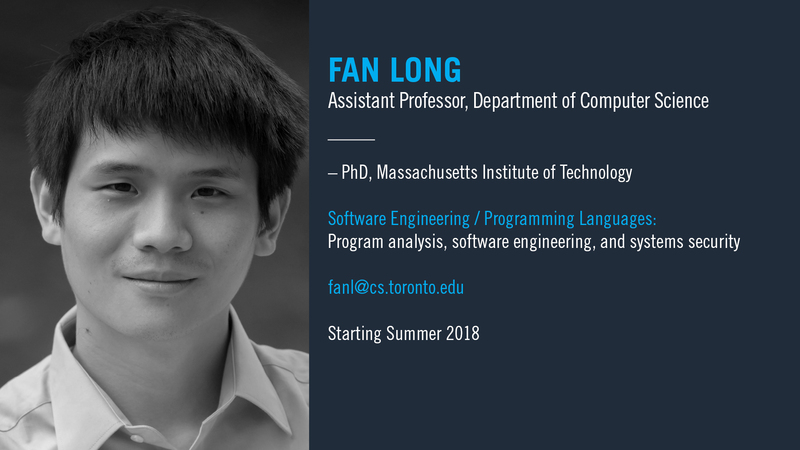 Assistant Professor, Department of Computer Science, Fan Long, is a PhD graduate of the Massachusetts Institute of Technology. Dr. Long’s research focus is in software engineering, programming languages includes program analysis, software engineering, and systems security. His work will provide a boost to the SE/PL research group. Dr. Long’s appointment begins summer 2018. Assistant Professor, Department of Computer Science and University College, Cognitive Science, Yang Xu, is a graduate of Carnegie Mellon University and joins U of T after completing his postdoctoral studies at the University of California, Berkeley. Dr. Xu is the first tenure-stream hire dedicated to the University College Cognitive Science program, and marks an exciting step forward in building U of T's strength in this area. 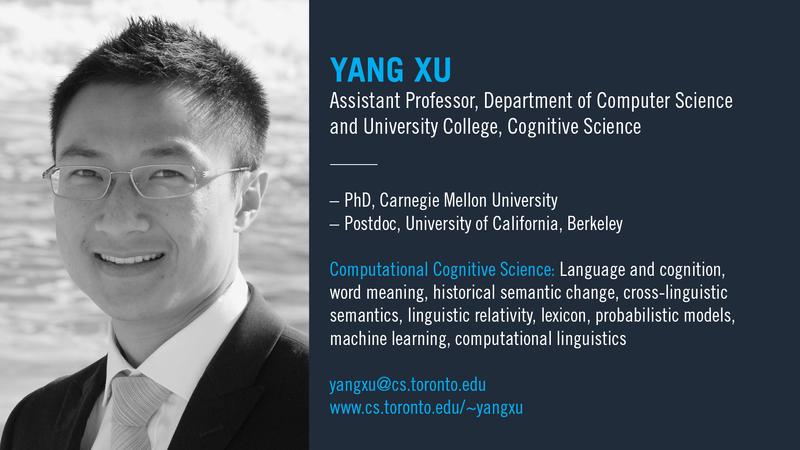 Yang brings a wealth of experience in the interdisciplinary research of language and cognition, including computational models of historical semantic change, cross-linguistic semantics, and linguistic relativity. His work adds to the department’s existing strengths in psychology, linguistics and artificial intelligence. Dr. Xu’s appointment began September 2017. 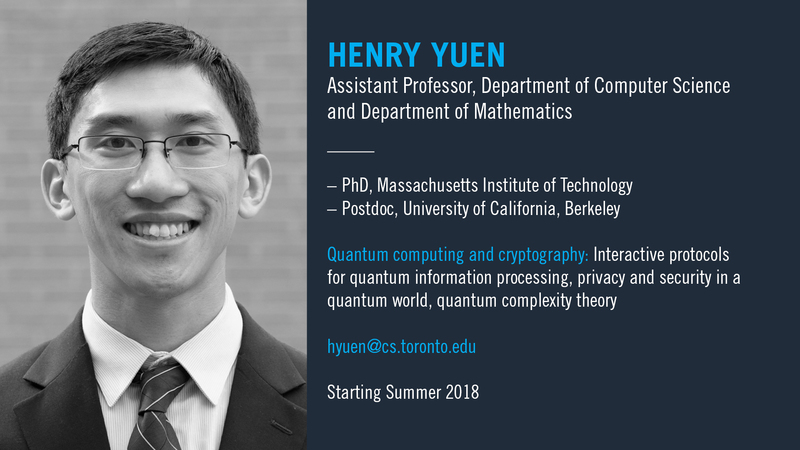 Assistant Professor, Department of Computer Science and the Department of Mathematics, Henry Yuen, is a PhD graduate of the Massachusetts Institute of Technology (MIT). Dr. Yuen’s research focuses on quantum information and its consequences for computing, cryptography, and physics. His research presents a bold new research thrust for the department in data privacy and security and adds an exciting new dimension to collaborations between computer science and mathematics. He is currently a postdoctoral associate at the University of California, Berkeley. Dr. Yuen's appointment begins summer 2018.